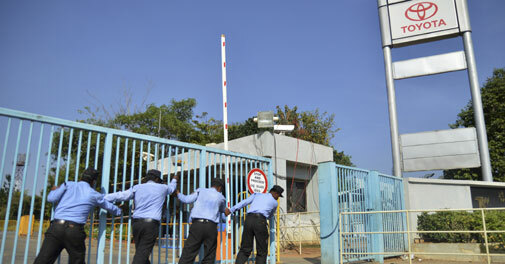 In an unprecedented and unforeseen event the Karnataka state government intervened in the ongoing lockout at the Toyota Kirloslar Motors plants in Bidadi, Karnataka & prohibited the lockout with immediate effect. AutoColumn readers might recall that we had reported on the lockout earlier. The trouble began earlier in mid March when labour unrest and disruptive behavior on part of the workers had forced the management to issue notice of a lockout to the state labour machinery & the Union. After the Labour commissioner intervened and tried to get both parties to sit at the bargaining table and amicably resolve issues, the management withdrew the lockout on 24th March as an act of good faith. It however demanded that workers would only be allowed to resume work contingent them to signing a good conduct undertaking. The workers’ union, while vehemently opposed to this condition had also appealed to the appellate authority saying that imposing such a condition on them amounted to a continuation of the lockout which was not in spirit with the principles of good industrial relations. The union members had also indulged in relay fasts for the whole week asking for reinstatement of 30 of its member workers who had been suspended. As such things had reached an impasse and both parties were in gridlock without either showing signs of backing down. The intervention by the state government has resulted in the direct prohibition of the lockout with instructions having been passed to restore normalcy by Saturday and resume operations. The reason given by the government is that the conditional agreement amounts to a continuation of the lockout under Section 10(3) of the Industrial Disputes Act. The matter has also further been further referred for adjudication in the Industrial Disputes Tribunal as far as the charter of demands by the workers is concerned. The TKMEU (Toyota Kirloskar Motors Employees Union) while welcoming this development has not yet confirmed on when they would be returning to work. A further decision on this is still pending post the General Body meeting of the union at Bidadi today. Keep reading for more updates on how the situation unfolds right here on AutoColumn.